If your company is the target of a merger or acquisition, you are undoubtedly facing a process called due diligence. Due diligence is essentially a thorough investigation into the state of the target company so that the buyer can be aware of all potential liabilities and other issues prior to the completion of the transaction. Due diligence is necessary for several reasons, including that your company is accurately valuated, that there are no major impediments to closing the deal, and to ensure all relevant documentation is properly drafted. If you have never been involved in the due diligence process as part of a major business transaction before, you may be easily overwhelmed by the complicated and time-consuming process. However, acting appropriately during this process can help to ensure the deal is as beneficial for your company as possible. Due diligence is crucial to corporate transactions, but if handled correctly, the process can be done efficiently. Here are some steps to take. Before examining piles of paperwork and numbers, a buying company will want to understand the goals and operations of your company at a broad level. This information will assist the buyer in structuring the purchase transaction. You will want to collect any news stories about your company or industry, provide concise summaries about the goals of your business, and put together a broad financial picture of your business to set the tone for the transaction. The information learned in due diligence will enable the buyer determine the value of your company. The buyer will want access to your company’s balance sheet and cash flow information for the past three to five years. In addition, it is necessary to provide the buyer with information including but not limited to your company’s organizational documents and contracts (such as the certificate of incorporation, certificate of good standing, bylaws, minutes of board and shareholder meetings, shareholder agreements, and outstanding stock options), as well as the company’s insurance policies, employee arrangements, intellectual property rights, lawsuits, real estate leases, accounts receivables, equipment, inventory, tax liens, etc. The buying company will want to dig into all important and relevant documents that may affect the sale or may demonstrate the true state of your company. Additionally, the buyer will likely want to interview executives and/or managers who have knowledge of your company’s finances, liabilities, pending litigation, and more. In many situations, fully preparing interviewees can help the due diligence process go more efficiently as their answers may be enough without providing additional documentation. Throughout the due diligence process, you should be prepared to provide a significant amount of information to the buyer. 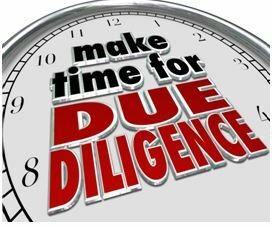 In some cases, due diligence may only take a few days though it may last substantially longer for larger companies and more complicated transactions. Though it may seem like a hassle, it is in your best interest to present the most complete and accurate picture of your company as possible to ensure a successful transaction. Whether you are the buyer or target company in a merger or acquisition, it is extremely important that you have the guidance and representation of an experienced attorney who has a thorough understanding of all of the legal implications of this type of major transaction. At Structure Law Group, LLP, our attorneys work closely with all types of businesses to ensure their best interests are protected in all transactions. Please call to discuss your situation at 408-441-7500 today.